The US Defense Department's Advanced Research Projects Agency DARPA is working on highly innovative technology that enables humans to control drones and full-sized aircraft by their minds' brain waves. It's command and control by thoughts. 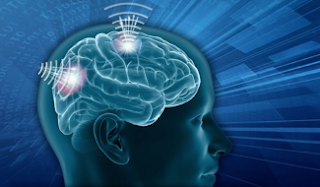 For the DARPA research, a micro-chip was implanted into a volunteer's brain. In simulations with drones on computer screens, the person was able to command and control the drones. DARPA also disclosed at a recent symposium the system works with swarms of drones and multiple aircraft. The user is able to steer multiple jets at once. The user of the microchip can send and receive signals from the aircraft and understand the dynamics of its environment. To some this is controversial research. DARPA's mission is to provide the US military with overwhelming technological advantages. DARPA views operating swarms of drones and multiple aircraft by thoughts as a big tactical advantage on the battlefield. They have a very significant research program behind this effort that goes back to 2015.